On Sunday, June 21st, Líithi Lushede Coven held their public Litha ritual at Waterfall Park in Independence, MO. With a heat index of 117F the day prior and heavy, torrential downpours of hail hours before, it almost appeared to be an awful weekend for ritual. However, the storm gave way to a beautiful, if not slightly muggy, 80F and partly cloudy skies! It was cool enough to bring my dog along, so Artemis got to attend his first Liithi Lushede ritual! 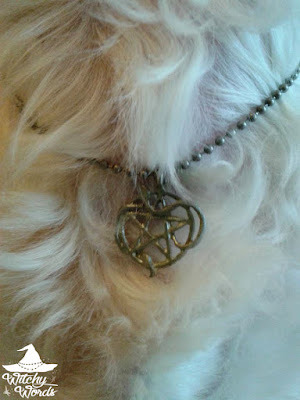 I even let him sport my first pentacle which he wore with pride. In contrast to his fur coat, I wore loose clothing and pulled my hair off of my face. My MAS has been acting up horribly, so it was important I was as comfortable as possible in order to last the ritual. Artie did better than I at managing the heat - plus he was quite the hit with the kids. What a perfect little familiar! The turnout for the day was absolutely astounding. Around 100 pagans turned out for the festivities, including some who had traveled for the event. A special hello to Witchy Words reader Clarissa and her friends who traveled all the way from South Dakota to be there today! We were blessed to have you! 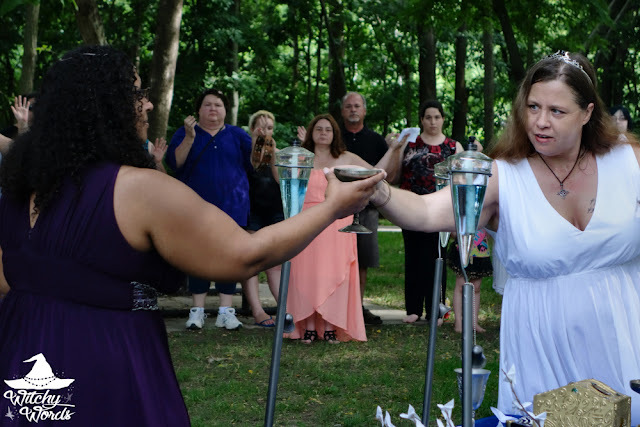 Today's ritual operated a bit differently from typical Liithi Lushede rituals and focused on Pandora, the first woman according to Greek Mythology. High Priestess Gwenhwyfar Wyrrd began by telling the story of Prometheus, who stole fire from the gods for the humans. Zeus, angry with Prometheus's thievery, chained him to the side of a mountain for crows to peck at his liver for eternity. However, this damnation was not enough. Zeus also felt the need to punish mankind for having fire, so he ordered Hephaestus to create a woman from earth and water. In fact, all of the gods had a hand in creating this woman. 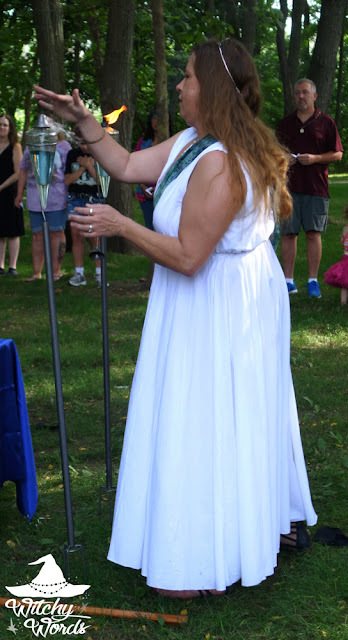 Gwenhwyfar opened the circle by tracing it with her staff, then returned to the altar to charge and blessed purified water and incense. The water was passed off to another coven member who walked the inside of the circle to cleanse it with the water. The incense was also passed to another coven member who walked the inside of the circle and cleansed the people with the smoke. We then returned to the Greek legend of the creation of woman as punishment for Prometheus's theft of fire. Instead of calling quarters as directions or elements, a god or goddess was assigned to each direction. When the woman was created, many of the gods gave her gifts to mold her into the most desirable person. Hermes, stationed in the east, brought her wisdom in the form of a staff. Apollo in the south brought her the gift of music in the form of a tambourine while Aphrodite in the west brought her the gifts of beauty and charm. Finally, Athena in the north brought her a beautiful garment. As each coven member representing a goddess stepped forward and gifted Gwenhwyfar with their gifts, they also lit an oil lantern in their direction. This included the High Priestess lighting the center candle once it was all done as a representation of Pandora herself. This process replaced the standard calling of the directions in a fun and creative way. The altar, surrounded by the fire of the gods, was impressive once lit. The story of Pandora continued. Gwenhwyfar spoke of how Pandora was then presented to Epimetheus. Prometheus had cautioned his brother not to accept any gifts from the gods, but when he saw the radiant beauty of Pandora, he couldn't refuse her. Out flew poverty and fear, sadness and sickness - the darkness entered the world. The High Priestess represented these by flinging out a small black cloth from the box representing each evil until there was no cloths left. She then closed the box, just as Pandora did in a panic when she realized what she had done. Inside, they found a beautiful butterfly of hope. 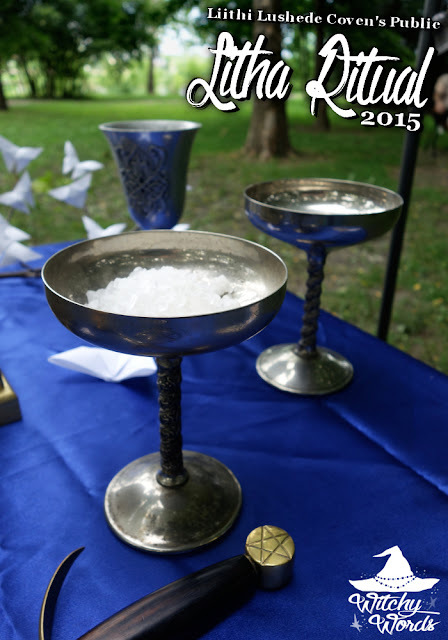 For ritual, a white origami butterfly was used to represent this attribute. Gwenhwyfar reminded the attendants that, no matter what pain or suffering you experience in life, those experiences give you hope - hope for change, hope for a better life, hope for happiness. And so the covenmates walked the circle passing out origami butterflies of hope to each person. John Mitchell, the bard, played a rendition of John Lennon's Imagine on his guitar while the butterflies were passed out. He was accompanied by Cathy Burchett on the drum. Finally, Gwenhwyfar made an offering of wine to Pandora and to the earth from which woman was created. The wine she provided was one she made herself! With that, we bid the gods farewell and closed the circle. While I was too overheated to stay, the celebration afterward included a potluck feast and a raffle which provides Liithi Lushede with the funding they need to put these events on! 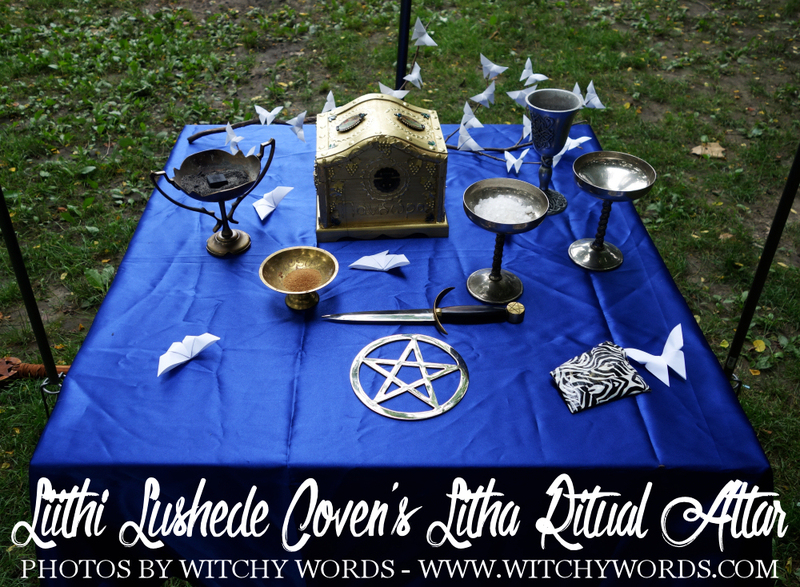 Líithi Lushede Coven's rituals are always an amazing experience. The coven and the community come together to create a truly unforgettable celebration. If you live or find yourself in the Kansas City area, I encourage you to come to an event! If you aren't near Kansas City, seek out the nearest public ritual and celebration. Not sure where to start? 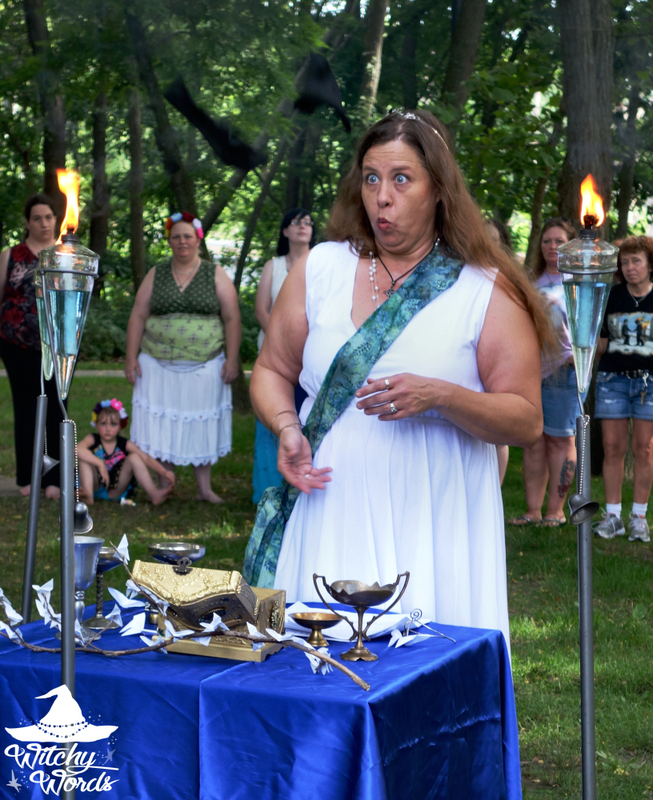 Try Meetup.com or Facebook for local pagan events near you! I hope you had a warm and happy Litha! If you ever make it out to KCMO, we'd love to have you! 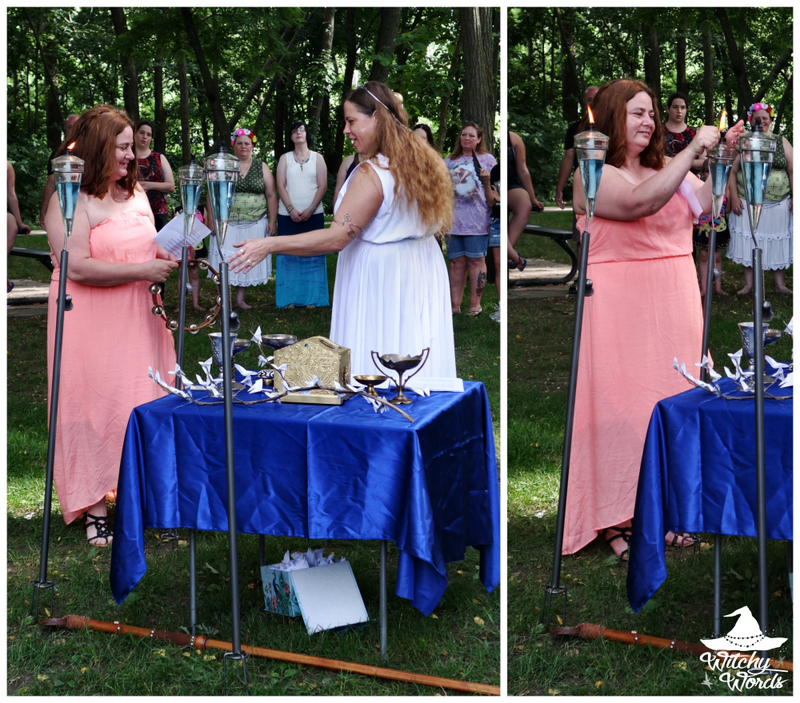 Thank you for sharing your lovely ritual and images <3 We had a wonderful solstice as well - an overcast morning which gave way to sunshine and ended with a shower that kindly put out our fire just as we were about to close! Glad to hear! Sounds like that shower was perfect timing. How perfect! Thank you so much for reading! I'm so glad you all could make it! I made it a point to make sure the HPS of Liithi Lushede gave you a warm hello. We don't often get people from outside Kansas or Missouri, so it was a wonderful surprise. Thank you for saying something to me! 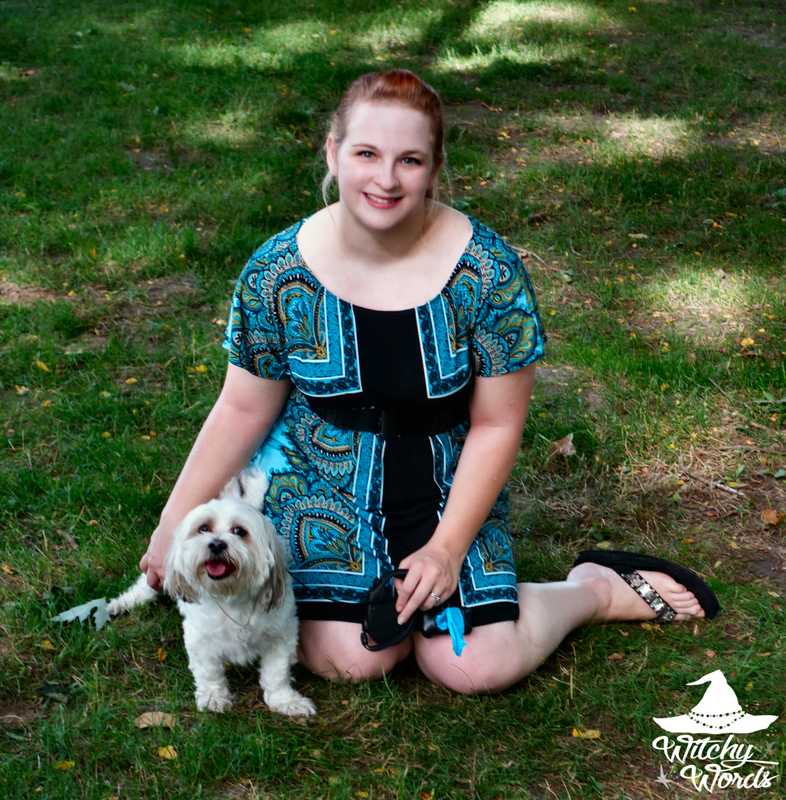 Sorry I wasn't as responsive as I wanted to be; between the heat and my dog, I was beat, but I truly appreciate it!